I have to admit that I sometimes get to travel for work - that's a good and bad thing. I don't like being away from my family for long and travelling gets a little tiring after a while. One exception to this is travelling to Melbourne which I love. Now, I had to be in Melbourne for 4 days last month (actually left Adelaide on the afternoon of the Matsuri on Mobara Festival) and decided to take my camera with me to keep me busy of an evening. I arrived in Melbourne around 8pm on a Sunday evening and immediately grabbed my trusty Canon KissX3 and headed into the city. One of my favourite destinations is Chinatown... a good place to eat and take photos. Now Chinatown, like much of the Chinese immigration into Australia, was really spurred on by the discovery of gold in Victoria in the early 1850's (btw definitely recommend a visit to Sovereign Hill in Ballarat to learn all about that). This is not so different to how Chinatown in Adelaide started, or indeed how many Chinatowns around the world. 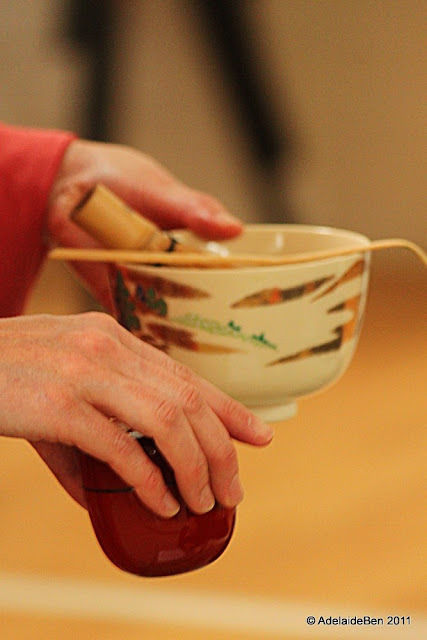 The focal point of Chinese culture in Melbourne became Little Bourke Street. When the gold eventually ran out in the 1870's, many Chinese immigrants decided to make Melbourne their new home, and Little Bourke Street started to evolve into the vibrant Chinese community - until Australia introduced the White Australia policy in 1901 - though it was officially known as the "Restriction of Immigration Act". A dark period in Australia's history. The act effectively evaporated the vibrancy in Chinatown as the flow of new migrants dried up, and life took on a different feel. It continued that way until after the second world war - and indeed the Act wasn't repealed until 1958. Finally, *colour* and multiculturalism was allowed to come back to Australia - bringing it's character and diversity once again to the streets. Of course, where there were immigrants, there was undoubtedly heathens for the saving, and the Wesleyan Methodist movement was particularly keen to get out and convert the Chinese as they came into Australia. They were in the goldfields, and they were also in Melbourne's Chinatown. The original Chinese Mission Church, built in 1872, is a little further up the street next to Cohen place (see above) - but this is a much older building. 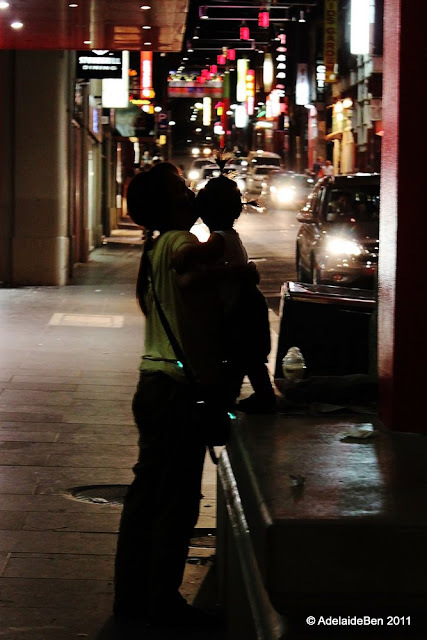 Of course it's not just the Chinese create the atmosphere of the street - as there are many Japanese and Korean restaurants on Little Bourke Street (and the many little alleyways that come off). Though I have to admit that many of these Japanese restaurants at least are still owned by Chinese. Something I always find a little disappointing as there's more to an authentic Japanese restaurant than the menu. It's also an amazingly clean part of the city... considering the amount of traffic that goes through here of a day... and I don't feel at all unsafe. 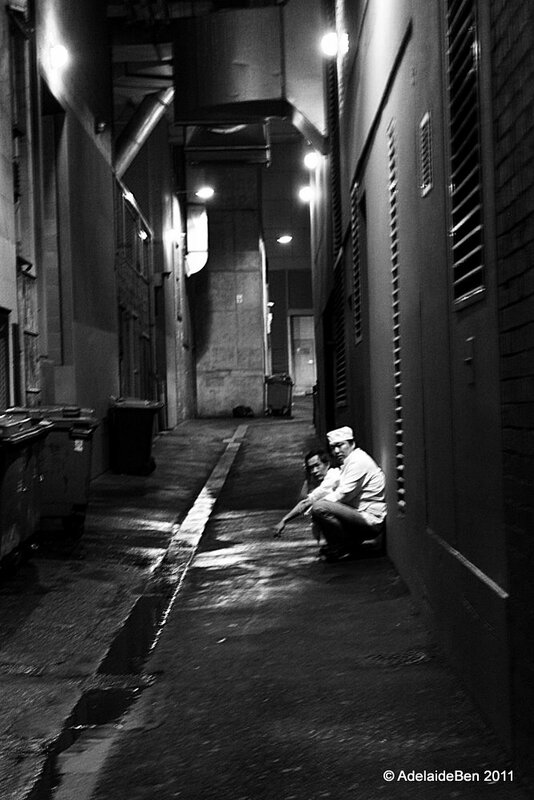 Perhaps I might if I spent a few more late nights wandering the alleyways, but for now I have the impression that it's a clean, safe, positive sort of environment. Just what you need when you want to go out for an evenings meal - or an evening of taking photos. I tried to take shots without people generally... but this is sort of non-representative of the street which is actually quite busy, even late in the evening. The restaurants do a bustling trade here, and I'm sure that the area is still a significant epicentre for employment for new migrants and old migrants alike. And I'm sure many of these dark alleyways have seen their fair share of dark dealings as well. But for me, Chinatown in Melbourne has a family feel to it. It _is_ the product of community and it feels welcoming to all. Actually - sometimes I wish it wasn't quite so welcoming walking past the restaurants with the women beckoning hungry passer-byers with their menus. Still, it's one of the many heartbeats of Melbourne, and a great place to visit - especially of an evening. And if you're here on every third Saturday of the month, there's a market in Heffernan Lane as well. There's also a Asian Food Festival that runs throughout all of September... alas, too late to enjoy that this trip. Chinatown's easy to get to - it's just between the main hub of Bourke Street and Lonsdale Street - and Chinatown itself runs for about 4+ blocks of restaurants and shops. 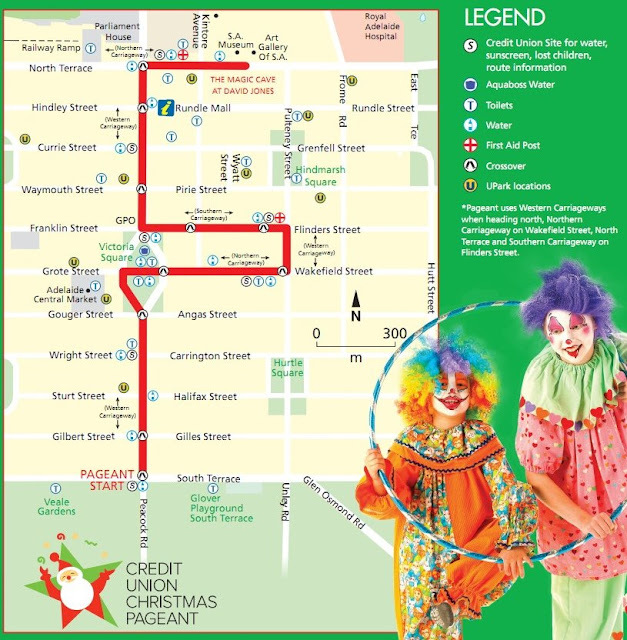 2011 Christmas Pageant - The Parade of Parades! Christmas time is for families... but especially for children. That's not to say that it's not important for a whole lot of reasons (obviously, if you're Christian, it's a lot more than a time to give presents). Still, for children, it's a time to just be... well.. children. Now - why am I talking about Christmas. It's only just turned mid-November... well, last weekend we had the Adelaide (Credit Union) Christmas Pageant. So that's why. What's the Christmas Pageant I hear you ask? Well, it's an old Adelaide tradition that's been around since 1933. Back then it was the grand event organised by a local department store, John Martins... but with the demise of that store, it's seen a number of sponsors with finally the Credit Unions coming to the fore. This was going to be L-kun's first Pageant... and whilst he had been looking forward to it, he was a little unsure of what to expect. I have to admit something... it was my first Christmas Pageant too. Even though I've live in or around Adelaide for most of my life, I guess I'd just never been in the right place at the right time (i.e. in the middle of Adelaide come mid November each year). This was going to be an adventure for me as well. As it was to the nearly half a million other people did (335,000 lining the streets, and another 150,000 watching on TV). The pageant starts at 9:30 am, and whilst we knew that people come in to get the best seat positions from before 6am, we didn't leave home till about 8:30. Amazingly we were able to find a park (off Hutt St) and also managed to find a half decent spot to watch the parade on Wakefield St. The Pageant starts off at South Terrace, and meanders it's way along 3.5 km of city streets before ending up in front of David Jones Department Store. The Magic Cave. Finally 9:30 arrives, and before long the Pageant starts to make it's way past our position. The Pageant is a combination of floats, figures, bands, and of course clowns. I'm not sure what the clowns have to do with anything, but I guess it reinforces the inclusiveness of the Pageant - it's not really about any specific religious meaning.... unless you count Father Christmas as being religious that is. But it is fun. The one thing that's amazing about the Pageant is that the participants are by-and-large employees (and employers) at the various Credit Unions. They take the responsibility of being in the Pageant seriously - seriously fun that is. And there's a few well known characters that make an appearance as well... hey, Puss'n'Boots. And no - this isn't a tribute to Monsters Inc, but rather Bruto the adorable (child-stealing) monster who has a heart of gold, and a belly full of... well... I'm sure he'll give back those children sooner or later. I'd be guessing this was Puff the Magic Dragon... although I've no idea how magical that stuff was that he was exhaling. He did look like he was having a merry old time however. What a great idea - the Naughty-Or-Nice-O-Meter. This was one of the new floats this year that had actually been designed by one of the local primary schools. As mentioned before - the role of the Pageant is to be as inclusive as possible, so there's a number of multi-cultural floats. Even one celebrating - as far as I can tell - Bollywood (the Hollywood of India in small scale). If you hadn't already picked it - one of the real stars of the whole day isn't actually on the street at all... but rather lining the streets. Adelaide at this time of the year has wonderful displays of Jacaranda trees, with their fantastic purple blooms. My favourites. And of course, there's also some Australiana there as well. And Funi and Wang-Wang (our rather expensive friends at the Adelaide Zoo... or is that the Westpac Zoo?) were there as well... with some support form a very local lifeguard. Just to show that it wasn't all about the colour and pageantry ... here's some B&W shots. Even vampires celebrate Christmas... apparently. Ah - back to safe ground... the clowns again! And to tell children that whilst the world might not be such a safe place, or that that times are tough financially, or that bad things happen even to good people... just for one period of the year, children can forget all of that "adult" stuff, and just have a laugh and enjoy the moment. It's an important thing you learn as a parent. Sometimes you just need to let the magic free. And who better to do that, than that ancient bearded fellow in the red pyjamas. Santa Claus aka Father Christmas. He finishes off the pageant every year, before taking up residence in the Magic Cave. Conveniently next to the toy shop... Still - as adults we can laugh about the commercialism of the season. But we didn't always do that. We used to just like our son... looking up to this mysterious adult, knowing that he was something special and he had the power to make it everything better. Now L-kun had been to a couple of local Christmas Pageants, and hadn't really shown much of an interest in them. It could be that at four years of age this year, he was able to appreciate it more. Or it could be that he felt the magic of the day. All I know is that he loved the whole thing. Thanks Santa. Thanks sponsors: The Credit Unions... and especially thanks to all of the people that volunteered there time, and talent, to make a truly enjoyable day. We'll definitely be back again next year Santa! Now - I've missed a lot of photos from the Pageant... but that gives me something to post about in 12 months time. Hope you'll join me again then... and even though it's early. Have a Merry November Christmas! Continuing on from the Matsuri on Mobara theme again... the day was a strange in the way that Spring days can some times be. It was slightly overcast but warm - indeed, verging on hot. The air was quite thick, and I'm sure that it was a hard day for some of the participants. 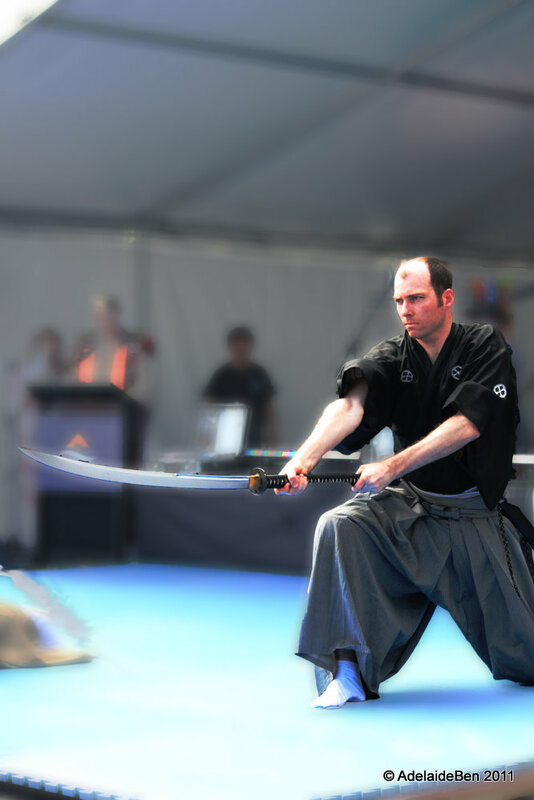 Especially the martial artists... one of the more visually impressive being the practitioners of Iaido - or the art of drawing the sword. And of course - we can't forget that the sword-drawing was in only part of the equation. Cutting in clean, efficient and determined way was very much an exercise in concentration and skill. And this is where I do a little poetic licence with photoshop...(not my normal thing). And of course - it's not all sword-work. 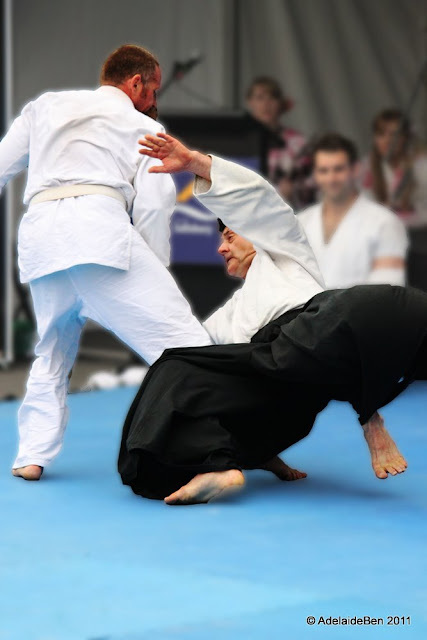 I'm quite fond of the principles and methods used in Aikido - though a relatively recent martial art (coming from the 1920s). It's emphasis on defensive redirection of your opponents force in combination with throws, and joint-locking holds is a much less aggressive form of self-defence. Indeed, one of it's fundamental tenets is defence whilst also reducing the harm to your attacker. 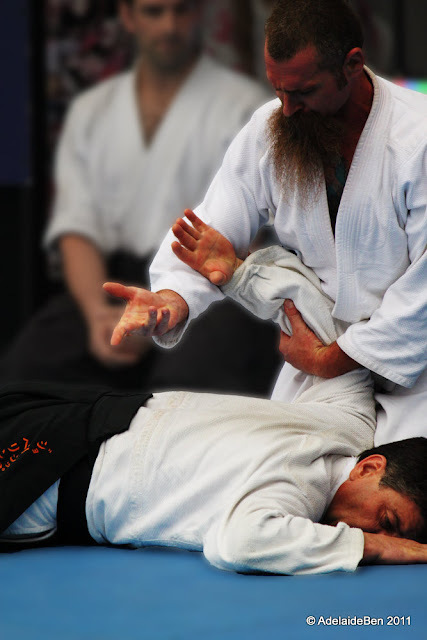 Now that's an unusual twist for a martial art... although perhaps in the same way, Aikido is often criticised for it's lack of realism. 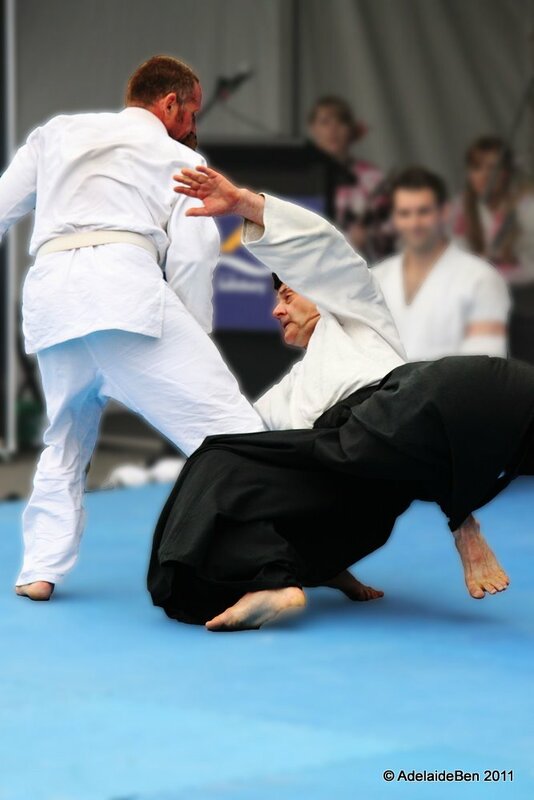 Aikido also has it's roots in a more fundamental religious core, being based on a form of Shinto found in pre-war Japan of the 20's... it became not so much a martial art as a means of finding transcendence of the soul. Of course - at Mobara Matsuri, these were replaced with some very interesting kata demonstrations of the various techniques. Lots of fun. 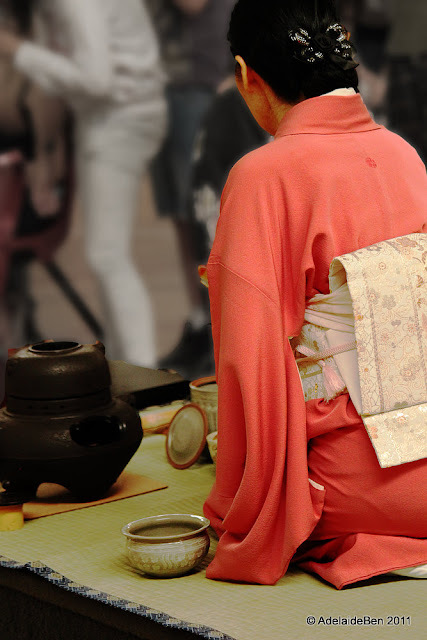 Of course the day isn't only about the martial arts of Japan... it's a day of all sorts of cultural and family enjoyments. And a good reason to get dressed in traditional clothes. Of all sorts and styles. It's also a good day to sample some Japanese cuisine. 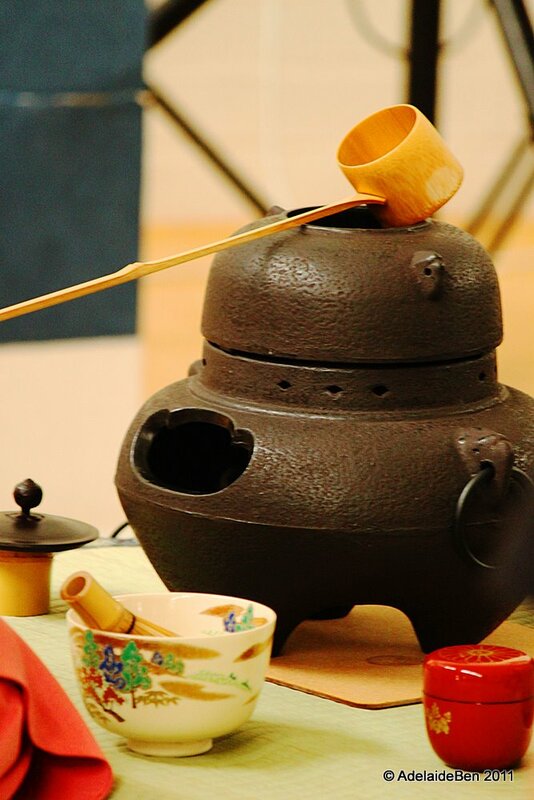 Though don't expect the best of the best of Japanese food at any sort of outdoor festival. It's pretty basic "food court" sort of stuff. And don't forget to grab some Ramune... one of the classic Japanese soft-drinks. It's a throwback to decades ago, and was for a time very difficult to get in Japan (or at least unpopular to drink). I suspect it's having somewhat of a minor resurgence - and it seems to be growing slightly in popularity here. Perhaps most of all for the unique ball-based sealing mechanism. It's a art-form that is as much about the process as the end-product (and infact perhaps more so). And lets not forget the beautiful washi, or japanese paper... hand made cards (hmmm for $4... not sure if that was a bargain). And whilst we're talking about paper. You could have a go at some shūji, or Japanese calligraphy. 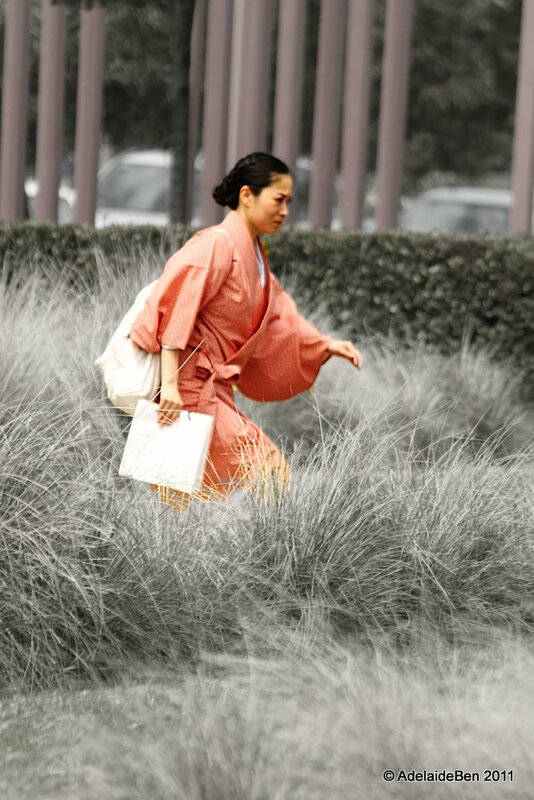 The idea is to write (japanese of course) with direct and unhesitating style - flowing and elegant. Of course - you could get someone else to do it for you. 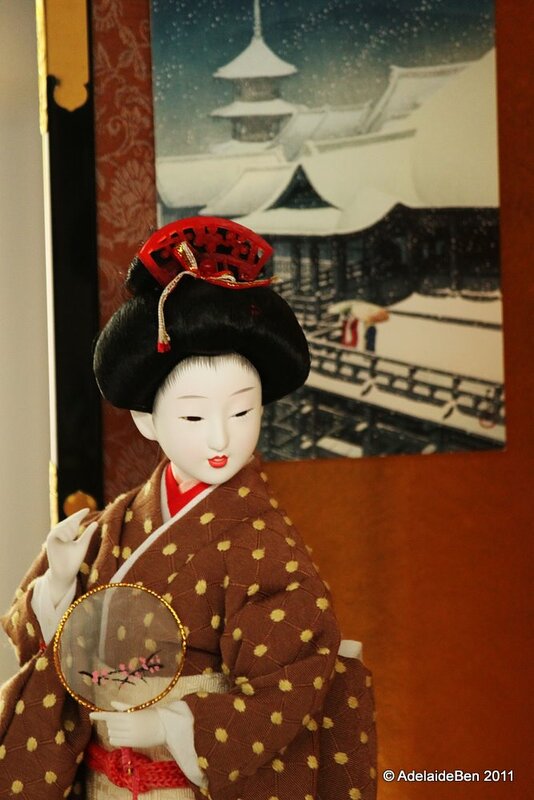 A classic Japanese ningyō or dolls - especially the geisha variety - are widespread in popularity. An icon of Japanese culture (and tourist shops). Another less traditional icon of course is Sonic... who was losing his head in the heat of the day. Still it was all in a good cause. 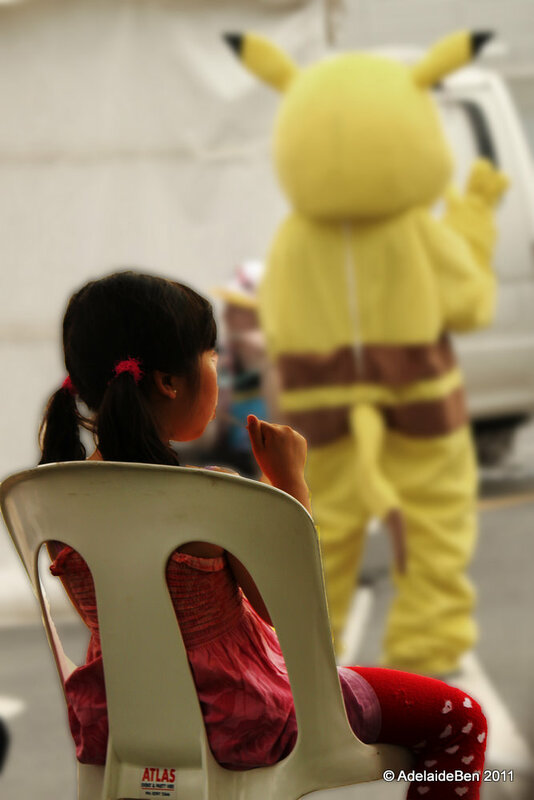 The children loved the characters (even when they were doing mock battles up on the stage). And thus we come to the end of my quick photographic review of the day. It's a great day out - even if you don't have any direct relationship with Japan. But if you do have one, it's a perfect occasion to grab the family and reconnect with the community. It is after all still very much a family day. Enjoy! 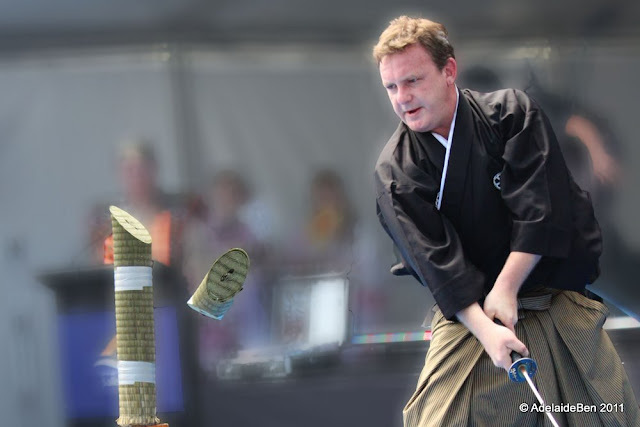 See you all at Matsuri on Mobara 2012... it'll be here sooner than you think!